The most popular and iconic hike in the Columbia River Gorge begins at Oregon's tallest waterfall, passes another waterfall almost as impressive and continues through lush forest on a loop of five miles. The 620-foot Multnomah Falls used to be the state's most popular tourist attraction until it was surpassed, in a thoroughly depressing moment, by Spirit Mountain Casino in 1998. Even so, expect plenty of company at the beginning of this hike, which starts at the Multnomah Falls Trailhead and historic lodge (which serves breakfast, lunch and dinner). The paved trail crosses a few scenic bridges showcasing Multnomah before climbing to an overlook at the top of the falls. The loop continues on Larch Mountain Trail and Wahkeena Falls Trail, showcasing a moss-covered 242-foot falls. The loop ends by dropping down to the Columbia River Historic Highway and following a footpath back to Multnomah Falls Trailhead. The loop is five miles total and climbs 1,600 feet. Elowah Falls, the second-tallest waterfall in the Columbia River Gorge, cascades 289 feet through a gorgeous amphitheater of lichen-covered basalt. 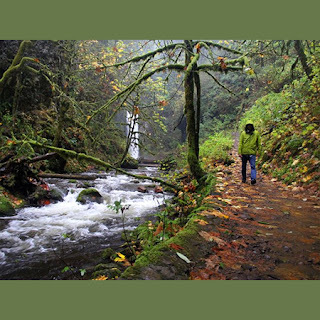 Though it gets less attention than its more-photographed sister, Multnomah, Elowah's hidden charms are worth the gentle forested hike off the well-trod path. The easiest hike on this list of moderate hikes, this trail has just about everything a person exploring the Gorge could ask for — waterfalls, forest, canyons and views. From the trailhead at John B. Yeon State Park, a short and very easy path runs 0.8 miles to an enormous amphitheater of stone where Elowah resides. For a bit more excitement and views, return down the trail and turn left at a junction that switchbacks uphill. You'll pass a beautiful view and eventually reach Upper McCord Creek Falls. The hike's total distance is 3 miles. I'm so glad to see your post. I love it really. Please share it in other blog too.